Well BETT has now been over for a good few weeks now and you have probably just started to think about what new initiatives you saw there that were of interest. 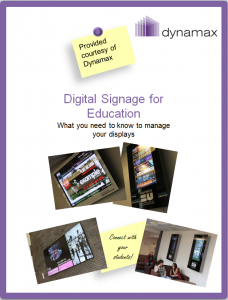 Well just in case Digital Signage was one of them we thought we should list a few not-so-usual ways of using digital signage in an educational environment, if you need more reasons to implement the technology. 1) Encourage staff and students to ‘’do something funny for money’’ i.e. 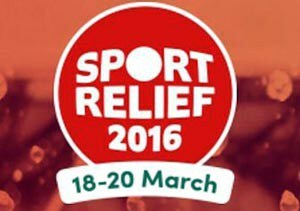 Red Nose Day (a fundraising event organised in the UK taking place in March). While word of mouth is the standard method of getting everyone around the school involved, digital displays could be an effective channel through which you can remind staff and students to do so. You can also use the screen(s) to show the most original, funny initiatives undertaken in previous years and offer everyone some much needed inspiration. Once the event is over, you can display photos and videos of the best activities carried out in the current year, thus publicly acknowledging your students’ efforts and ingenuity. 2) Run a photography contest to encourage creativity (and leverage one of the talents and hobbies of the Generation Y) while creating entertaining and fresh content for your screens. According to a recent survey conducted by UCAS Media (Universities and Colleges Admissions Service) 75% of the surveyed students in the UK use their phones to take photos. There are lots of tools allowing students to create media (Videolicious and Skitch are just two of them) but once this is created it must be acknowledged and promoted. Digital screens allow you to do just that and let students know that their work is appreciated. 3) Create an unusual Time Capsule. This original idea isn’t our own but belongs to one of our clients, Preston College that decided to present their history and heritage in a different way. 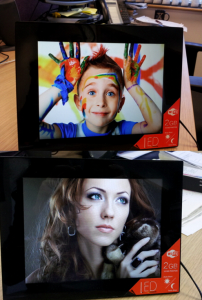 Using eye-catching images from the past and present shown on a 21’’ digital display installed in front of their new building, they created a point of communication difficult to ignore- by passers-by, staff or students. 4) Partner with theatres, cinemas or gyms in your area to promote their offers and events that are relevant to staff and students. Either for a fee or as an act of goodwill, this is a great way to show some support to your community and inform your students about events worthy to attend or that could help them with their studies (think concerts for music students). Learn more from Warwick Students’ Union that managed to generate revenue through third-party advertising. 5) Promote your surveys- perhaps not so unusual but definitely useful. Let’s face it: getting people to answer surveys without giving out a prize isn’t easy. Either because they’re perceived as an uninteresting activity (to put it mildly) or because they’re so easy to forget about, getting a decent amount of answers to surveys can be difficult. Putting the news up on a screen along with a clear call-to-action would not only increase awareness (ensuring the news reaches those not checking their emails) but would also remind those that forgot about it to take action. Are you giving out a prize to encourage response? Even better. Display a photo of the prize if it’s something tangible to make sure people won’t resist it. 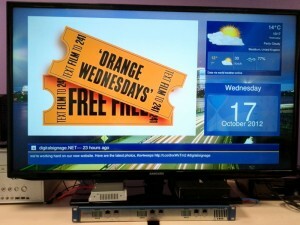 Display run by digitalsignage.NET. Watch our webinar to see how we make it happen. 6) With all the snow we’re getting at the moment in the UK and Europe, Christmas seems closer than Easter. A digital signage system proves extremely useful around special times of the year such as these when there are so many things happening and so many things to talk about. One screen can support a multitude of messages, from greetings to announcements of special events or even live videos from such events. As a side note, watch this space to learn how you could use digital signage for Easter. At Dynamax, we believe that videos and photos are an important part of our lives. Learn how digital signage in general and digitalsignage.NET in particular can help you share different moments from the life of your establishment and make your communications stand out without breaking the bank. Download our white paper or contact us for a free consultation . We’d be glad to help you. What other things could educational establishments use digital signage for and what interesting projects could they pursue or promote with the help of the technology? Share your ideas with us below. 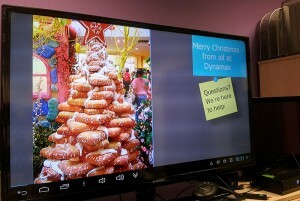 This entry was posted in Digital Signage, Education, Tips and advice and tagged digital signage for education by Dynamax. Bookmark the permalink.